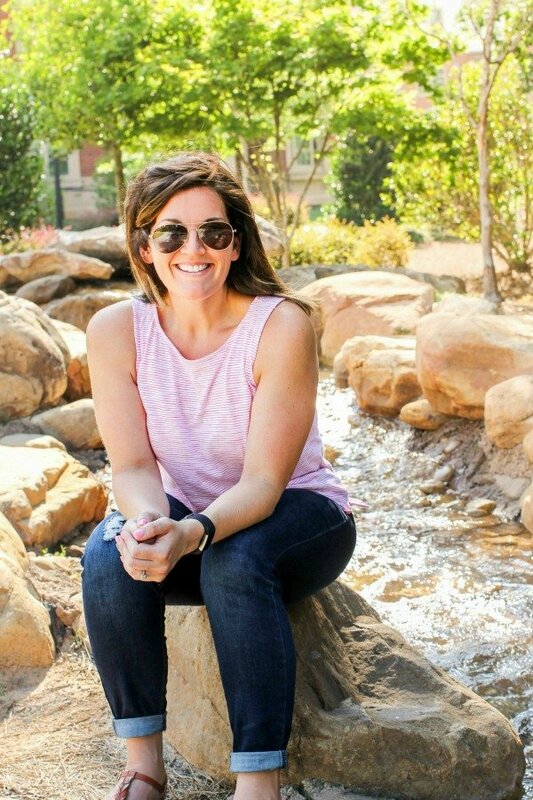 August 27, 2018 By Allyson 24 Comments This post may contain affiliate links. Read my disclosure policy. Caramel Apple Poke Cake is an easy cake mix recipe that takes hardly any time, but everyone will think you slaved all day over it. Son’t like cake mix? Go ahead and use your favorite spice cake recipe, but I love using this shortcut with this recipe. 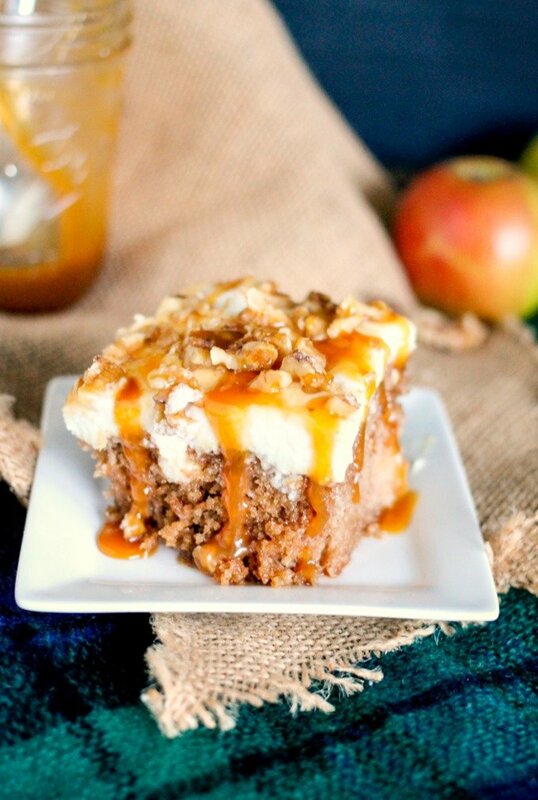 Jump into fall with this GREAT, totally delicious and super simple Caramel Apple Poke Cake! It’s the fall dessert you’ve been dreaming of! A poke cake is a baked cake that is then ‘poked’ with the back of a wooden spoon to make holes in the cake. The holes should go to the bottom of the cake, allowing whatever filling to fill the holes. Poke cakes can be filled with puddings, whipped creams, syrups, caramel, jell-o and other liquids. 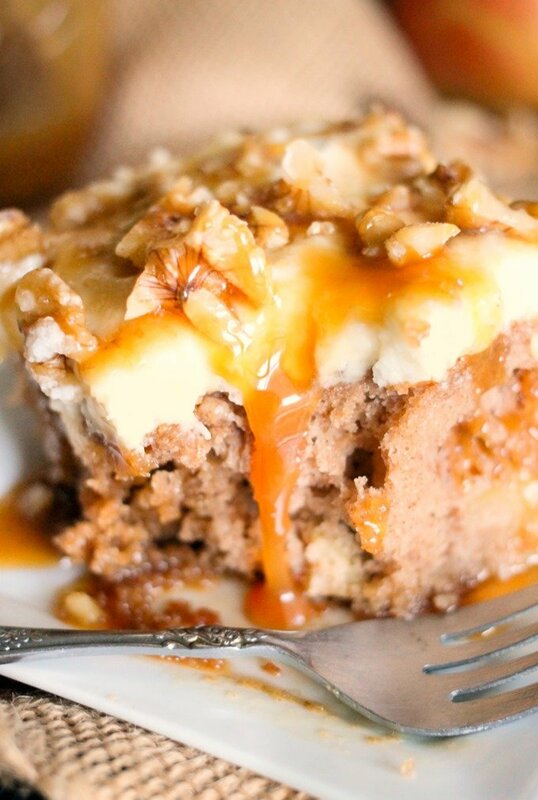 Use your favorite Spice Cake Mix for this recipe. Add chopped apples to the cake batter (make it according to the box directions). I love using fresh tree picked apples for this recipe, but in the fall super markets are FULL of fresh apples! Bake it! Once the cake is baked, poke holes using the handle of a wooden spoon (like this) all over the cake. Drizzle caramel – try my HOMEMADE CARAMEL SAUCE RECIPE – all over the cake, letting it flow into the holes. Make the stabilized whipped cream (see below), then spread it over the top of the cake and top with more caramel and walnuts!!! YUM!!!! Caramel Apple Dumplings – delicious caramel apples wrapped inside a crispy sugary shell! This is the PERFECT dessert! Caramel Apple Cider made in the slow cooker has only 3 ingredients, will leave your house smelling amazing, and warms your soul. Apple Monkey Bread is loaded with caramel, apples, and a sweet brown sugar butter glaze, this going to be everyone’s favorite fall treat! Serve it up for breakfast or dessert! On this list you will find over 15 Fall Slow Cooker Recipes which are perfect to set and forget! 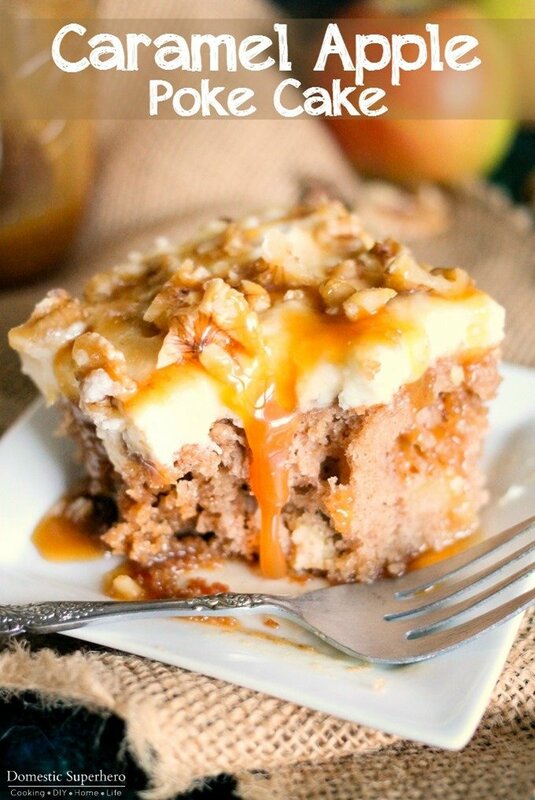 Caramel Apple Poke Cake is packed with apples and then smothered in whipped cream and caramel. It's the easiest most delicious fall cake! Prepare box cake according to directions. In a small bowl, place apples and add flour and cinnamon, toss to coat. Fold apples into the batter. Pour into 9x13 baking dish. Bake and cool completely. Prepare stabilized whipped cream: In a small bowl, add 2 TBS warm water, and add your gelatin, mixing to combine. Let sit for 3-5 minutes, or until set. Using a stand or hand mixer, pour in heavy cream and powdered sugar. Beat for 30 seconds on medium speed. Cook gelatin in microwave for 30 seconds, stir, and then 30 additional seconds, stir. Gelatin should be liquid, if not, cook until it's liquid. Turn stand mixer onto high speed, and slowly stream the gelatin into the bowl with the cream. Turn all the way onto high and beat until stiff peaks form. Set aside. Use the end of a wooden spoon to poke holes all over your cooled spice cake. Drizzle 1/2 cup caramel syrup over the poked holes. Spread the whipped cream over the top of the cake, then top with remaining caramel syrup. Add chopped nuts to the top, then refrigerate at least 2 hours. This recipe was first published on Domestic Superhero in September 2016, and was updated in September 2017, and then August 2018. This looks delicious but where are the apples? Wow, you are so right, I totally forgot to write them into the written recipe! If you watch the video, you can see that I add the apples into the batter before baking! Geez, total brain lapse! Thanks for letting me know! This looks like a perfect fall dessert! This cake looks incredibly moist and delicious! I love DESSERT anything! I want to stuff my face with this now! I could use a nice big slice of this right now. It looks amazing! I love that it’s almost fall, and I love how easy this cake seems to make! It looks absolutely scrumptious! Poke cakes are the best! This one tops the list for fall must-make desserts! Such a simple, easy cake recipe for fall! Love it! Such a good combination! Just in time for the fall season! What a perfect fall dessert! This looks like the perfect way to welcome in fall! So good! I love how easy poke cakes are to make. Can’t wait to try this version! I have to eat this! I can’t resist caramel! Sounds perfect! YUM, these really sound delicious! Thank you for a great recipe! I love a poke cake recipe! This looks so good! This is the most amazing cake I’ve ever seen! This is absolutely droolworthy! Can’t wait to give it a try!